Anoto Live™ Forms makes data capture processes more efficient for any enterprise, allowing legacy paper-based processes to be turned into digital data capture solutions without the necessity to replace existing processes or re-train users. Anoto Live Forms makes hand-written forms virtually instantaneously available to any business, therefore expediting the processing workflow and minimising data capture errors such as a missing signature or other key information. 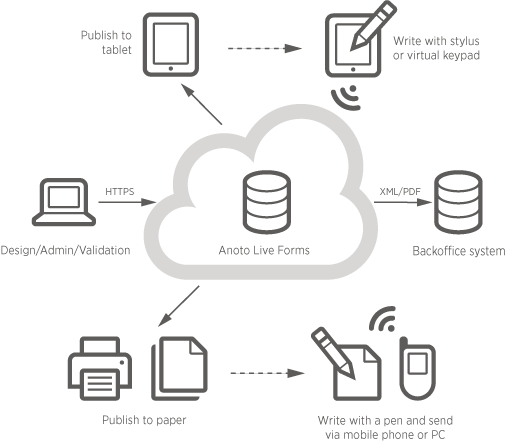 By presenting the captured form data in a computer readable format, Anoto Live Forms can integrate with most business systems to aid the workflow in processing or recording hand written forms. Where paper is still utilised, use Anoto Live Forms to turn your analogue process into a digital workflow.